Uses near infrared transmission spectroscopy to measure hydroxyl and carboxyl numbers in polyols and residual solvents in polymers. NIR Technology Australia has released the NIT-38 polymer analyser. It uses near infrared (NIR) transmission spectroscopy to measure hydroxyl and carboxyl numbers in polyols and residual solvents in polymers. It also monitors polymerisation reactions and can be used to identify plastics. NIR light passes through a 10m to 30mm sample of liquid polyol or polymer where the O-H, C-H and N-H bonds absorb energy in proportion to their concentration. The measurement takes less than five seconds. For monitoring polymerisation reactions, the ability to obtain a measurement of hydroxyl number or carboxyl number can provide manufacturer a means of detecting end points in real time. Polymerisation reactions can be monitored in real time using the NIR Technology Australia Software (NTAS) program. By initiating a reaction within a glass cuvette, the software will collect spectra as the reaction proceeds andd display it on the PC screen. The same instrument can be used to measure residual solvents in polymer streams, as well as water and unreacted monomers. Up to 100 calibrations can be stored in memory and when connected to a PC, the results files can be easily uploaded. The NIT-38 polymer analyser uses a diode array spectrometer. This optical system has no moving optical components and is independent of orientation and vibration. The analyser has been designed for ease of operation and requires two keystrokes for an analysis. Along with the compact size and rugged construction, the NIT-38 polymer analyser can be used in the laboratory or in the processing plant. 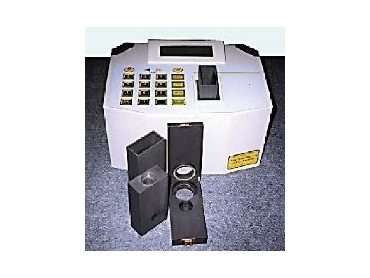 The built-in computer controls the operation of the instrument, computes the parameters for the samples and displays the results on the LCD screen. Data can be stored in the analyser's memory and later downloaded onto a PC. Alternatively the analyser can be controlled from a PC and the data stored in the PC. NTAS also provides a full suite of routines to allow PLS calibration development, spectral collection, display and manipulation, library search and discriminant analysis.